There’s a word you’ll hear again and again if you spend time following local politics—especially if you live in a town that is (like most American towns) faced with economic challenges and residents living in poverty. That word is blight. The thrust of these sorts of articles and the initiatives they cover is that vacant, crumbling and/or abandoned properties are harmful eyesores that must be eliminated in order for cities to move forward. Demolishing “blighted” properties will make neighborhoods more attractive and might increase home ownership and encourage reinvestment. Vacant buildings can attract criminal activity like drug use. They sometimes pose safety hazards. Getting rid of them is overwhelmingly framed as positive by local governments that often leverage hundreds of thousands or even millions of dollars to do demolition work (often through state or federal grants). And yet, there’s something darker that lurks beneath the surface when we talk about “blight.” The word completely disregards the past of a place. When you label something blight, you utterly negate any purpose it may have had and any hope of saving it. It is mere garbage to be discarded. And it’s not just individual buildings that are labeled as such. Whole blocks and neighborhoods can receive this designation, either officially or by association. Once the label has been applied, it can be a natural progression to start thinking that the people, businesses and institutions that are still alive in these neighborhoods are also blight. I was at a friend’s parents’ house in Milwaukee for a fundraiser recently. Their neighborhood is in one of the poorer parts of our city and as we pulled up to the house, the amount of empty lots on the block was striking; the street looked like a mouth with half its teeth missing. In a way, there was a peaceful pleasantness about it. The lots had been filled over with grass by now and they sat empty, as if this quiet neighborhood was dotted with dozens of mini-parks. Yet these lots were mostly marked by signs that said “City Property,” “Keep off grass,” and “No Trespassing,” making them a far cry from welcoming public parks. Are these empty, off-limits spaces better than crumbling homes where drug dealers congregate? Many of the residents around them undoubtedly feel that way and surely the city does too. The grassy lots communicate a message of opportunity—fill this space—rather than a message of decay and disrepair that would likely send a potential developer running in the opposite direction, afraid to tackle mold, sinking foundations and the inevitable rats, cockroaches and other pests. 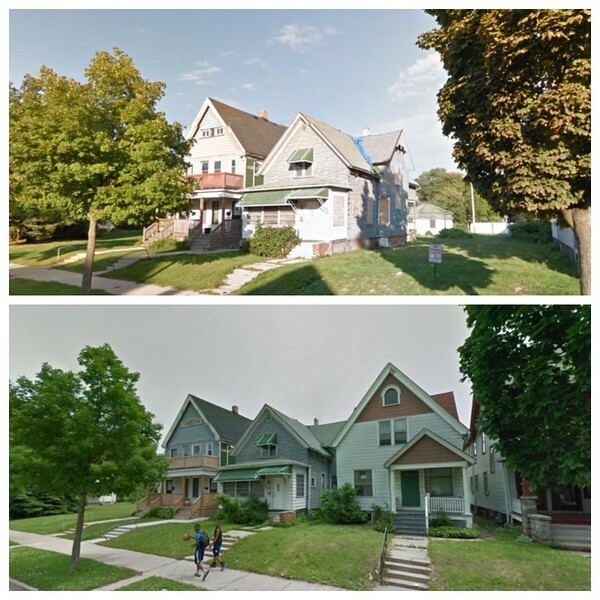 I wasn’t there to see the houses in this neighborhood before they were torn down and I’m not an architect, so I can’t say whether they were lovely representations of historic architecture, or whether they could have been rehabilitated easily and brought back up to a habitable condition. I do know, however, that the very organization that my friend was hosting a fundraiser for is also in the process of looking for a building to house its future operations, and that the organizers have been looking into vacant commercial properties, feeling hopeful that these present an excellent opportunity to put in sweat equity in exchange for affordable office space. For a scrappy start-up like this, building from scratch would be financially impossible. Outright demolition of unused or abandoned properties takes that option off the table. I can also say for certain that these demolition sites were once home to families—mothers, fathers, sisters, brothers, aunts, uncles, cousins, grandparents—many of them for decades before they reached the point of being called “blight” and demolished.